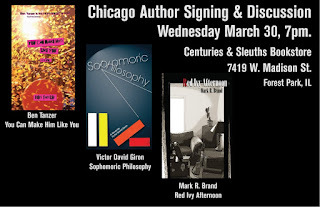 I was thrilled to be invited for the first time to Centuries & Sleuths bookstore in Forest Park, IL for Daddy-Cool: An Author Book Signing and Discussion, alongside my fellow Chicago authors Ben Tanzer and Victor David Giron. I anticipate talking quite a bit about Life After Sleep and the fatherhood portions thereof, and I will have copies of Thank You, Death Robot and Red Ivy Afternoon on hand to sign and sell. 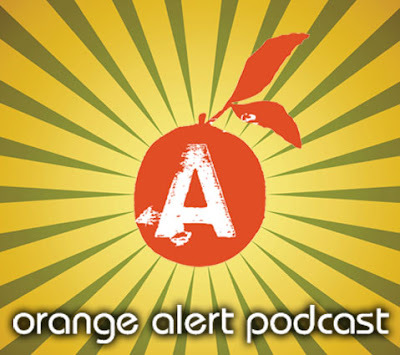 Also, I'm returning to the stage at The Whistler in Logan Square for the Orange Alert reading series, invited by the very awesome Jason Behrends and joined by Brandon Will, Heather Palmer and Cassandra Troyan. As always the Orange Alert reading series is held on the third Sunday of every month at 6:00 PM at the Whistler. If you're in the Chicago area on either of these dates, come and hang out. I can't speak for myself here, but I know for a fact that there will be some stellar readings happening with the other folks at these events, particularly that handsome devil Ben Tanzer, and his new book You Can Make Him Like You, which is taunting me from the top of my reading list, and which I'll have a review of as soon as I finish Patrick Somerville's The Universe in Miniature in Miniature.